The Flame Nebula (or Christmas Tree Nebula) (NGC2024) is a region of gas and obscuring dust in the constellation Orion. 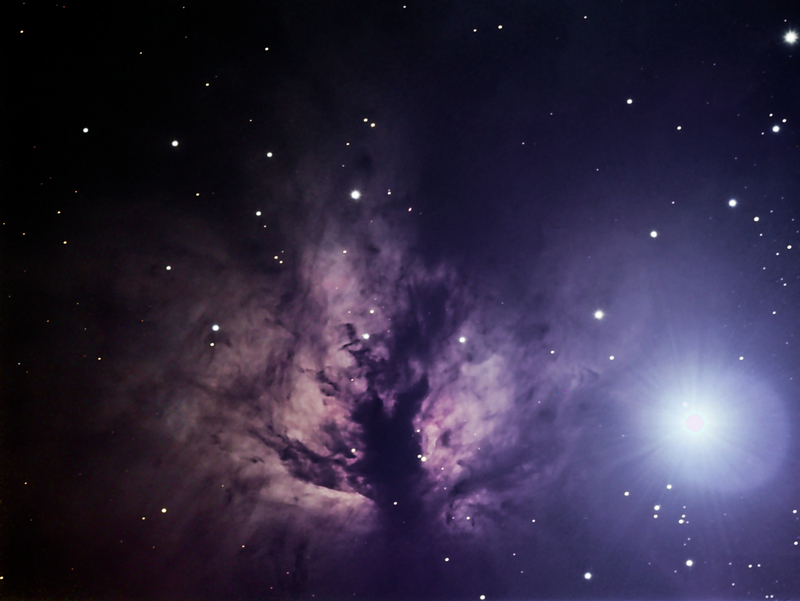 The bright regions are an emission nebula, while the dark areas are the result of light-obscuring dust. This nebula is easy to locate since it is very close to the bright star Alnitak (Zeta Orionis), which is the leftmost (as viewed by northern observers) star in Orion's "belt". 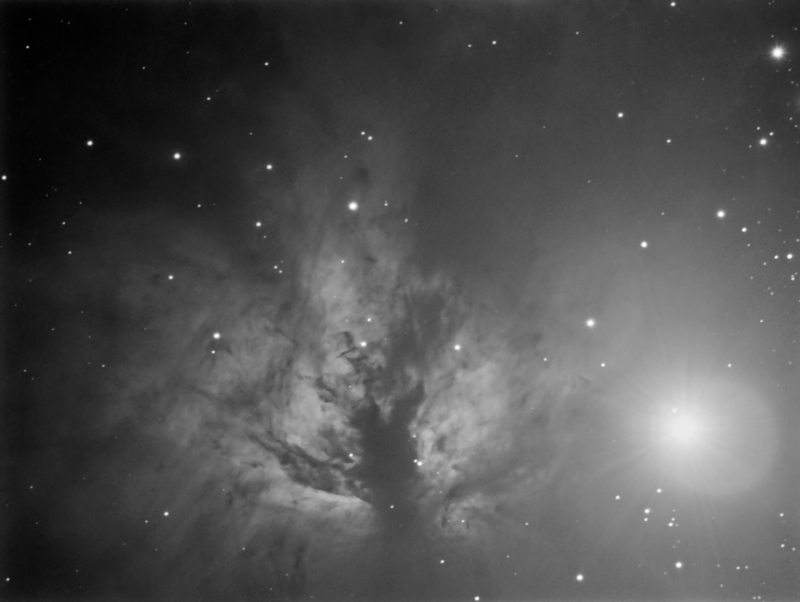 The above image is a color composite collected on 29-30 December 2010 with a SXV-H9 monochrome camera through a William Optics FLT110 4.3" f/7 refractor. A 94-minute luminance exposure was combined with red, green, and blue-filtered exposures of 46, 50, and 48-minutes, respectively. Below is the 94-minute luminance exposure processed to highlight the extended nebula. More information about this object can be found at Wikipedia-Flame Nebula. 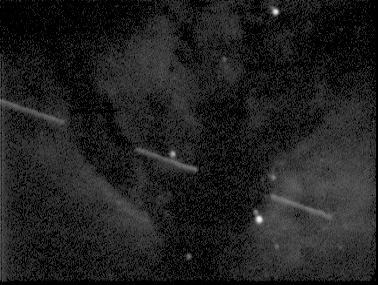 While taking an earlier image of this nebula on 18 December 1997, a geosynchronous satellite wandered through the field of view being imaged. The image below is a composite of three successive 10-second images in which the object can be seen slowly drifting from the lower right (east) to the upper left (west) in this image. Geosynchronous satellites are satellites placed in extremely high orbits, approximately 22,241 miles, above the Earth's surface. This orbit allows the satellite to circle the Earth in exactly one day, and so the satellite remains approximately stationary above a particular location on the Earth at all times. If the satellite is stationary relative to the Earth, why does it drift in this image? My telescope was tracking the stars which is performed by moving the telescope counter to the motion of the Earth. Since the satellite is stationary relative to my location, it appears to be moving from west to east in my image as my telescope sweeps across the sky east to west. More information about geosynchronous satellites can be found at Wikipedia - Geosynchronous Satellite.